MANILA, Philippines – Is singing the great stress reliever? It appears to be so at least for two popular government personalities. On Thursday, May 3, after apologizing to the Commission on Human Rights for defending the Manila police over the CHR’s discovery of a detention cell behind a bookshelf in a Tondo police station, Philippine National Police chief Gen. Ronald “Bato” dela Rosa sang his heart out with Van Morisson’s “Have I Told You Lately” that was popularized by British rock singer Rod Stewart in the 1990s. Aside from defending the Manila police, the PNP chief also earlier claimed that that CHR officials and staffers’ April 27 visit to the secret jail was only “for show” ahead of the Asean Summit. But on Wednesday, Dela Rosa said he was ready to discuss with the CHR how issues on alleged arbitrary detention and abuse being hurled against policemen could be addressed. “Lahat naman tayo Pilipino. Lahat tayo ayaw ng human suffering. Kung kailangang aksyunan natin ‘yan, mag-uusap kami [We are all Filipinos. All of us don’t like human suffering. If we need to take action on that, we will talk about it],” the PNP chief said. 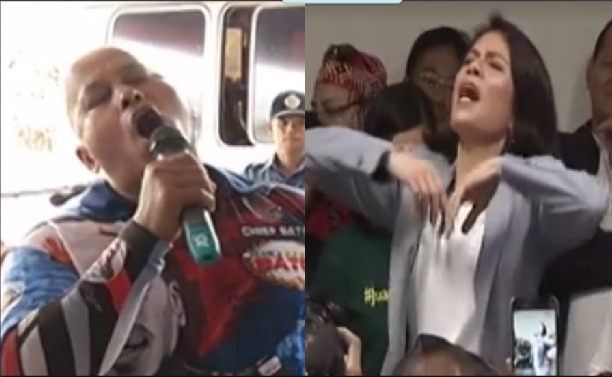 On the same day, Department of Environment and Natural Resources Secretary Gina Lopez belted out her version of singer R. Kelly’s 1997 hit “I Believe I Can Fly” with raised arms and closed eyes. Lopez let her hair down and asked her supporters to sing with her after the Commission on Appointments thumbed down her appointment.